The dream was always the same, Arthur Chavez says. He was following a bumblebee through a forest, stumbling over puddles and branches. When he caught the bee, he’d find himself onstage, wearing a suit, in front of an applauding crowd. After the third time, Chavez decided the dream was a sign. He quit his job at a Fullerton gas station and enrolled in community college, on his way to a bachelor’s degree. His first semester as a transfer student at Sacramento State, he started participating in the ROTC, lost 75 pounds, and declared a double-major in psychology and humanities/religious studies. He planned to become an Army officer, which he hoped would help him obtain U.S. citizenship for his mother. Chavez faced a reality all too familiar to California college students: trying to find a home on a student budget in a housing market gone berserk. The state’s public universities serve a student population that is about half low-income, who must compete for housing in some of the most expensive neighborhoods in the nation. While California provides more financial aid for non-tuition expenses than other states, the grants have failed to keep up with the state’s rising cost of living. 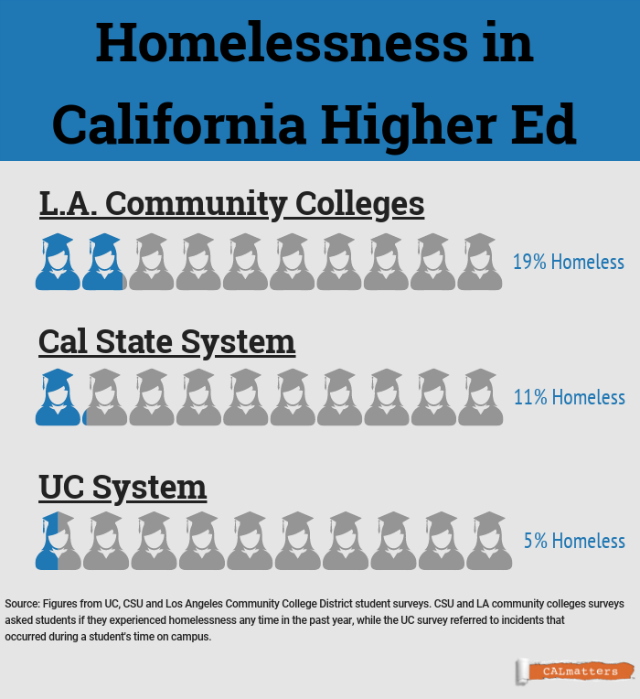 One in ten California State University students say they have been homeless at some point in the past year, according to campus surveys. Among community college students in Los Angeles, the figure is one in five. Already converting double rooms to triples to increase capacity, some campuses have also begun acting as social service agencies, setting up a patchwork of programs that includes giving students emergency grants for rent payment, and reserving some dorm beds for homeless students. Bills under consideration in the California Legislature aim to increase the supply of student housing, reduce its cost and boost aid. Yet they likely will prove insufficient to solve what experts say is the extreme end of a nationwide student housing crisis. Chavez had wanted to live in one of Sacramento State’s dormitories, but that would have brought his costs for the year to about $5,000 more than his financial aid package, he says. So instead, he’d rented a room in a private home, paying $425 per month. He says when he was asked to leave after a dispute with a housemate, he’d just spent about $2,000 to fix his car so he could commute back and forth to school. Another housing option fell through, Chavez says, and he was out the $225 he’d put down as the security deposit. Meanwhile, bills were piling up: $174 for a semester-long parking permit, $600 for textbooks. His part-time job providing home care for an elderly woman helped, but the hours were irregular. So he ended up bunking in the cramped car—a familiar feeling. As a child, he and his mother had slept in their car for a month after she and his father split up. Now, they talked by phone every day. Unemployed after a workplace accident, she lacked money to send him for rent. When she heard about his living situation, she couldn’t stop sobbing. Over the past two years, California has seen a burgeoning movement to address students’ living expenses. The state Legislature set aside $7.5 million last year to fight campus hunger, and colleges have started food pantries and meal-sharing programs, signed up students for food stamps and created apps to notify them about leftover catering food. “California is way ahead of the rest of the nation,” in addressing students’ basic needs, said Temple University education policy professor Sara Goldrick-Rab, a leading expert on the non-tuition costs of college. Yet finding affordable housing for the state’s 2.7 million public college and university students poses a more stubborn challenge than fighting campus hunger, experts say. The solutions come with higher price tags. Increasingly older than 25, California students sometimes can’t count on parental support and may even have dependents of their own. With students living both on campus and off, alone or with families, every situation is unique. Last month Assemblyman Marc Berman, a Palo Alto Democrat, convened a hearing on the state’s Master Plan for Higher Education—the 1960 document that laid out a blueprint for providing affordable, high-quality education to Californians by dividing responsibility among the University of California and California State University systems plus community colleges. Billed as a discussion on how well the Master Plan served today’s students, the Fresno hearing quickly turned into a teach-in about student hunger and homelessness. After starting off the evening with jokes, lawmakers turned somber as student after student stepped to the microphone to share stories of commuting more than 50 miles to school, or working three jobs to afford rent. California needs a Master Plan for students’ basic needs, added UC Riverside student Lennin Kuri. Students who walk into Danielle Muñoz’s Sacramento State office are met with aromatherapy-scented air and a pile of healthy snacks. As the campus’s sole student services case manager, Muñoz helps stressed-out students navigate the local housing market. The school maintains on-campus dorm rooms for just over 2,100 students on a campus of 30,000. Like Chavez, most students can’t afford to live in the dorms, Muñoz says, which cost $700 to $1200 per month, not including meals—and off-campus apartments aren’t much cheaper. Last semester, Muñoz awarded 30 low-income students emergency grants—double the number from the semester before—to spend on security deposits, temporary housing and other urgent needs. They’re paid for by donations from alumni. The university also sets aside four dorm beds for homeless students to use for up to 30 days while they look for a permanent place, and connects some with community members who have volunteered to provide housing. Students dealing with housing issues often miss class, Muñoz says. “They’re either gripped by their insecurity, they’re out looking for housing or they don’t have money for gas. But Muñoz says she feels stymied by a housing market in which the median two-bedroom apartment in the zip code nearest to campus rents for more than $2,000. What her students really need, she says, is a tiered rental system that takes into account what they can pay, and non-profit developers to build more units. She estimates that the average low-income student gets back $4,000 to $6,000 in financial aid per semester after paying tuition. If they spent 30 percent on housing—the nationally-recognized standard for “affordable”—that would amount to $300 to $500 per month. But it’s close to impossible to find housing for that amount. Because support for struggling students is often privately funded, and campuses have flexibility on what to implement, services vary widely from campus to campus. Humboldt State has started a home-share program that matches students with elderly residents, reducing housing costs for both. At Chico State, students can access free hotel vouchers for short-term stays, and the campus will co-sign apartment leases. UCLA in 2016 opened a shelter run by and for students. The leadership on some other campuses, however, has been less aggressive. At the macro level, there are some signs policymakers are taking students’ housing woes more seriously. The University of California has pledged to add 14,000 housing beds by 2020 and says it is on track to exceed that goal if current projects move forward as planned. The Legislature is considering a bill that would extend density bonuses to developers who build student housing, allowing them to add up to 35 percent more units than zoning typically allows if they designate at least one-fifth of the beds for low-income students. Students could use the information from their federal financial-aid application to qualify. Democratic Assembly members Anna Caballero of Salinas and Joaquin Arambula of Fresno have proposed setting up a pilot emergency housing loan program at three CSU campuses. Under AB 2784, students who prove that they are homeless or facing eviction could borrow enough to pay for up to two years’ worth of rent. The debt would be forgiven if students successfully complete the academic semester in which they receive the loan. The state-funded program would expire in 2022, and campuses would have to report on whether students who get the loans end up graduating. 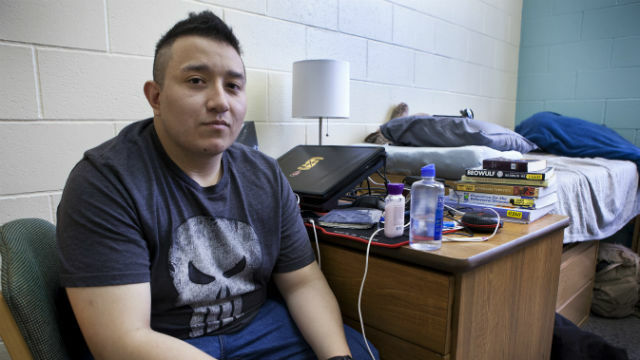 It’s based on a ‘rapid rehousing’ model—the idea that getting students like Chavez into permanent digs as quickly as possible can stave off the ripple effects on their academic and personal lives. Such interventions often draw criticism from those who say college students have always struggled, or that they just need to manage their money responsibly. To respond to that line of thinking, researchers like Goldrick-Rab have begun studying how helping students with food and housing costs impacts their academic performance. “Every college wants to know, if I invest, will students graduate?” Goldrick-Rab said. Meanwhile, Chavez is settling into a new temporary home in one of Sacramento State’s dormitories. With his grades plummeting, one of his professors had pulled him aside. “She said, ‘You obviously understand all the concepts; why are you failing my class?’ “ Chavez says. Chavez broke down and told her about his stresses. She connected him with the school’s emergency housing program, and on Thursday, he moved in. He’s received permission to stay through the end of the semester, then hopes to get a summer job at a restaurant and save for next year. For now, he has the spartan double room with its mini-fridge, two single beds and view of the courtyard all to himself—a luxury after a month in his car. But he says he’ll happily give up the extra space to share with a roommate.